Price - Free, but it cost me $6SGD ($4.70USD) for the upsized 6-piece meal to try them with. She packed them up surprisingly well for just sauces. But they did survive unharmed. A about a month ago, a reader from New Zealand sent me a message asking if I tried the Southwest Ranch Sauce. Since I haven't been in New Zealand in over a year, of course I haven't, so she happily send me up 2 packets to try (along with a Sweet Mustard, and Barbeque!). Note - If any other reader if interested in helping out this blog, please feel free to send me an email. If you send me something, I'll be sure to send you something in return! 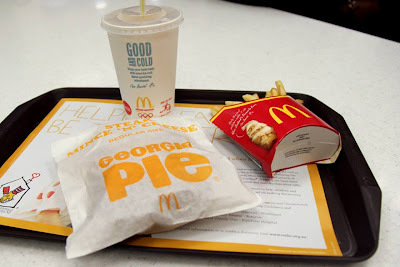 My wife and I bought a 6 pack of Chicken McNuggets in the Chinatown Point branch of McDonald's to try them out. A keen reader might notice that on many of my reviews, there's always a lone McChicken on the receipt. That's my wife's favourite sandwich, and if I am reviewing something, she often has that whilst I try whatever is new. The one that is in the cup, is not ketchup, but Garlic Chilli Sauce! A great dip for nearly everything. The Mini, patiently waiting for her lunch. Naturally, the most important sauce for me to try for this review was the Southwest Ranch, as this was the only promo sauce and it was something I haven't had before. Not sure if it was just because it was promotional, or if it was a test for new packaging, but it came in a different size and shape package than the standard nugget sauce. Though it was slightly smaller (25g v 28.3g), the packaging made it seem like there was more sauce, so this may be a visual change that McDonald's is looking to introduce to make their sauces seem bigger, and actually serving less. One additional change was the larger mouthed package is now wide enough that you can dip side of a sandwich into it, which I found very useful, as I enjoyed the sauce so much, I was dipping the half of the McChicken that my wife gave me into the sauce directly, which wouldn't be possible with the normal size package. The flavour of the sauce was somewhat nicer than I expected, there isn't much ranch-based anything in Asia, and combined with the chipotle-esc smoky flavour was a nice combination. After my first bite, I thought it would make a great replacement for mayo on one of McDonald's many chicken sandwiches, even better on a grilled chicken wrap. I was very glad that she send over 2 packages, as I would be able to try it again another time. Sure...we cheated a little. I removed the top before taking a photo, so I placed it back on in order to get this. NZ on the left, SG on the right. The reader, who also happens to work at a McDonald's down in NZ, told me that though all the nugget sauces are made in the US, the NZ versions have different ingredients than most of the rest of the world, so I was eager to compare the BBQ against the standard one which is available here in Singapore. Both my wife and I came up with the same conclusion about the sauce, the one available in Singapore, was noticeably sweeter than the it's NZ counterpart. Both had about the same amount of BBQ taste, and the exact same colour and texture, it was only the sweetness that differentiated them, and it was only because we tried them back to back that we would be able to tell so. Since we only ordered a 6 piece combo, and already had 4 sauces (plus chilli) to dip in, we didn't bother opening the Singapore standard Sweet 'N Sour Sauce. Also, the "Sweet Mustard" that was sent in from NZ, tasted nearly identical to "Honey Mustard" that you'd get anywhere else. At the time of the review, Singapore didn't offer Honey Mustard as a dipping sauce only Curry, BBQ and Sweet 'n Sour. Only last week did they start a new promotion introducing both Wasabi, and Honey Mustard. So when I try those later this week, I'll be sure to compare it to the NZ Sweet Mustard sauce. What was still left over after all the nuggets, and even dipping most of our fries as well. 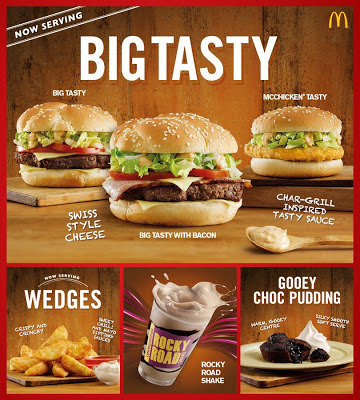 Also, apart from this great sauce, McDonald's New Zealand looks to be having a number of new promotional items which, honestly, all look pretty amazing. 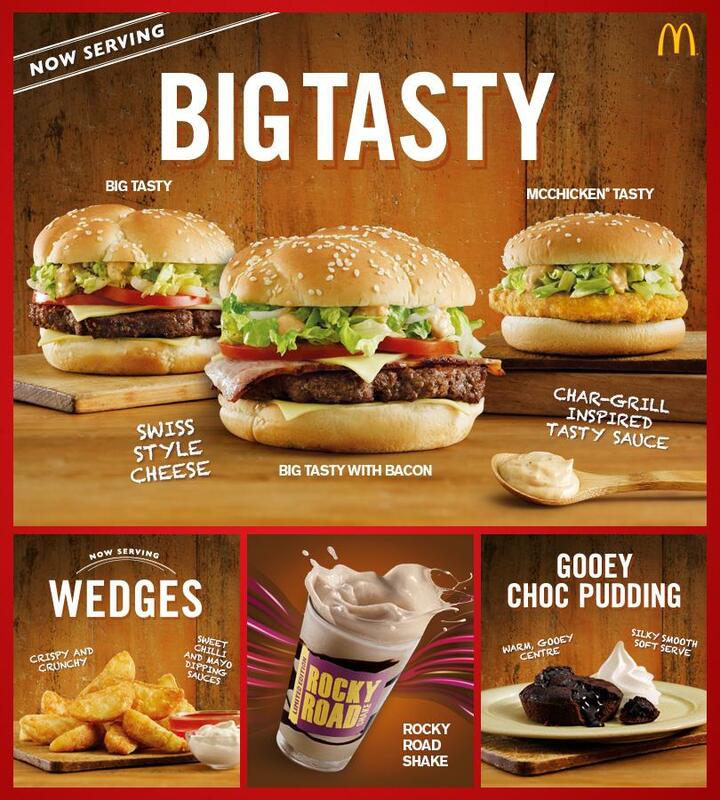 The following photos are from the McDonald's New Zealand Facebook page. Georgie Pie - Steak & Cheese Pie! This looks fantastic!